As the sun sets on August, what will be my abiding memories of summer 2018? It goes without saying that the heat and drought that descended on the South East from early May until early August will not be forgotten. Sustained fine weather, with many consecutive days in the high twenties centigrade, provided exceptional growing conditions for the tender plants I love. Many have grown larger and flowered earlier than ever before. I’ve experimented with plants generally considered too delicate to be grown outdoors and enjoyed surprising success. Bromeliads, tillandsias and anthuriums have flourished in the shelter of my tiny courtyard, not just sitting patiently, but actually growing handsomely. The downside was the excessive amount of watering required to keep everything alive. Garden writer Jack Wallington kindly praised my ‘good husbandry’ after visiting in early August, the most sincerely appreciated compliment I have been paid as a gardener. But keeping the garden in its prime took its toll. I was frequently to be found in the garden after dark, either with a watering can or a torch, stalking vine weevils and snails. I rarely got enough sleep during the week, but it was enough to know that visitors appreciated my efforts when they flocked to The Watch House on August 4th and 5th, raising £1400 for the National Gardens Scheme in the space of just 8 hours. It would be a mistake to imagine that we’ll be blessed with similar weather next year, or that 2018’s heatwave will come to be considered ‘normal’. The likelihood is that next year will be cooler, or at least less consistently warm. Like any gardener I will adapt as nature demands and take care not to be lulled into a false sense of security. Towards the end of July and through August came some unexpectedly vicious storms, bringing with them high winds and heavy rain. These did a lot of damage in my garden, shredding banana leaves, toppling dahlias, pushing over trees and flattening coleus. The worst storm, on Friday 27th July, was especially destructive and unwelcome, coming as it did shortly before my garden opening. We’ve been warned that with warmer summers we should expect more extreme weather events, and it certainly feels like this prophecy came to pass in 2018. It’s a salutary reminder that I must think again about protecting my garden from the wind that comes from the north and the south, and that I really must stake my plants earlier in the year. I know I should, but I hate to see canes poking up everywhere (and hate it even more when I fall into a forest of them, as I did the other day!). 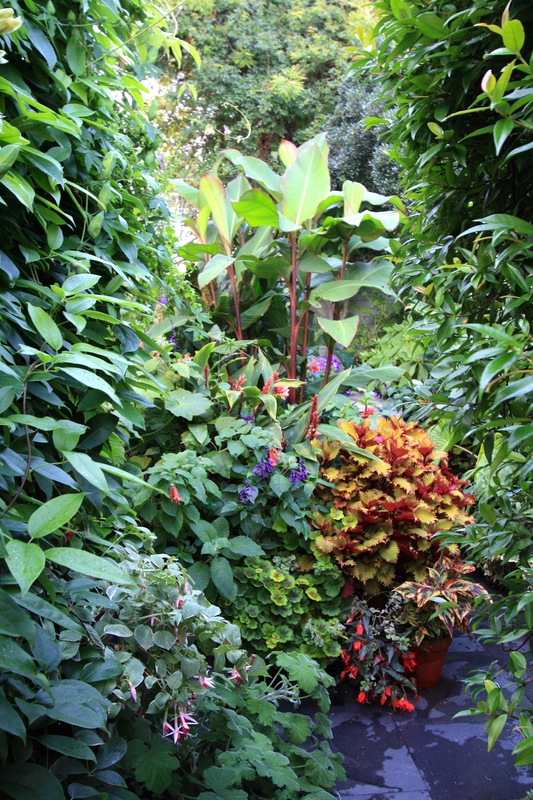 However, staking really is a necessity if I wish to continue with the jungly planting style I have developed over the last 5 years. 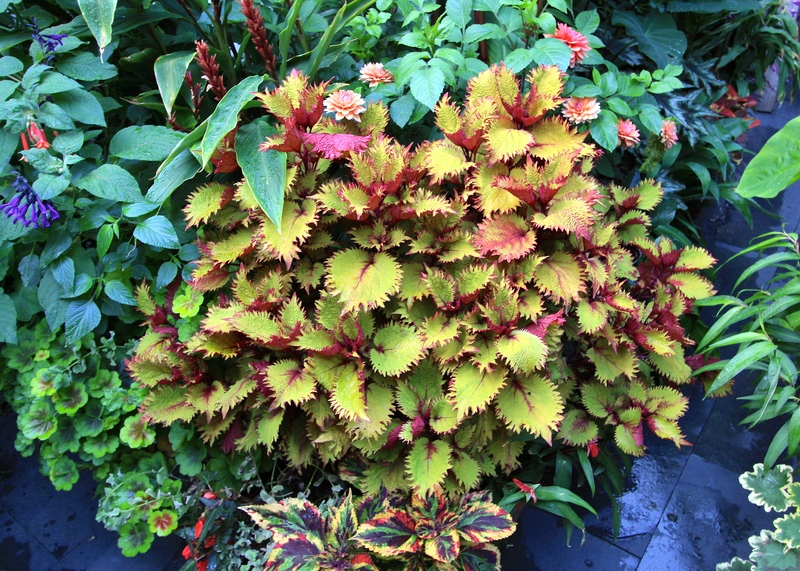 A cooler end to August has been a blessing, reducing the burden of watering and restoring colour to the foliage of my coleus, especially ‘Henna’ (above) which was starting to become badly bleached by the sun. I shall wait a few weeks longer before offering an assessment of the coleus varieties I have been trialing, although I can already reveal that ‘Pineapplette’ has withered and died despite receiving the same treatment as all the others. You win some, you lose some. At the moment I am particularly taken with the small-leaved varieties such as ‘Lord Falmouth’ and ‘Burgundy Wedding Train’. Since the rain resumed, most plants look fresher and happier, although there are slightly fewer flowers in the garden overall. It’s easy to forget how dusty and dull foliage can get during a dry spell. As September approaches I feel content with how the garden is looking, although I can think of countless opportunities for improvement. I have missed my agapanthus, still recovering after the beastly spring, and anticipate it may be another two years before they are back on top form. I can already tell that the workshop is going to be an absolute godsend over winter, especially now that it has a supply of electricity. I shall be overwintering all my gingers and bananas in there, but not before I’ve potted up my spring bulbs. These ought to have been ordered by now, but I’ve not had the time, or the funds: another job for the autumn ‘to do’ list. The lilies I purchased at Hampton Court Flower Show are about to start flowering, and soon will come nerines, more gingers and more dahlias. There’s plenty of life in this year yet. TFG. I’d love to hear your thoughts on the summer of 2018. Did you love or loath the hot weather? Were you a slave to the hose or did you resist the urge to irrigate? Do let me know how you and your plants have fared and what you’re looking forward to this autumn. It sounds like you are describing our summer here this year. It has been hot and dry. I don’t have a tropical garden like yours. It is more a typical Midwest garden. Lots of shrubs, flowers etc suited to this climate. Climate is changing. This hot drier climate seems to be the norm. I only water the newest plants but water, water, water I have done and am still doing. I am hoping that soon the fall rains will commence and I can put away the hose for the year. 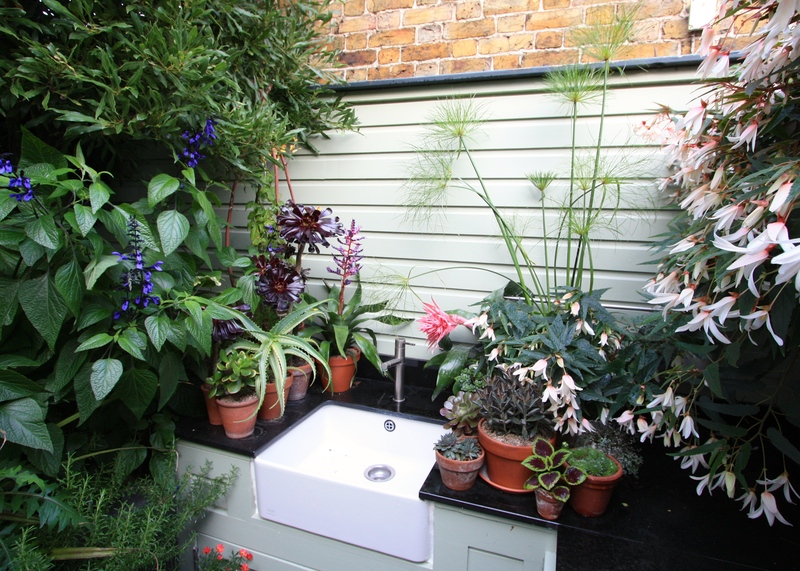 I can’t comment on the summer of 2018 (which sounds like a normal summer for us, perhaps without the vicious storms) but I would love to know about the plant with the pinky white flowers to the right of your tap and basin. It looks as though it should be a fuchsia, but I’m not sure…. the garden is looking fab, Dan. What a stunning achievement! Thank you Jane. It’s simply called Begonia F1 ‘Trailing White’ although it’s flushed with shell pink. I grow it every year as it’s such a reliable plant for shade. Such a nice description of your garden (Jack Wallington) 🙂 It really looks wonderful. The weather in Denmark was much the same as you had. Too hot and too dry. I watered and tried to pick out the most important things to survive. Think I only lost a tree (Cornus Contorversa) and a bush (Ribes Alpinum). And a few perennials. Love your garden, enthusiasm and blog. Have a nice late summer. 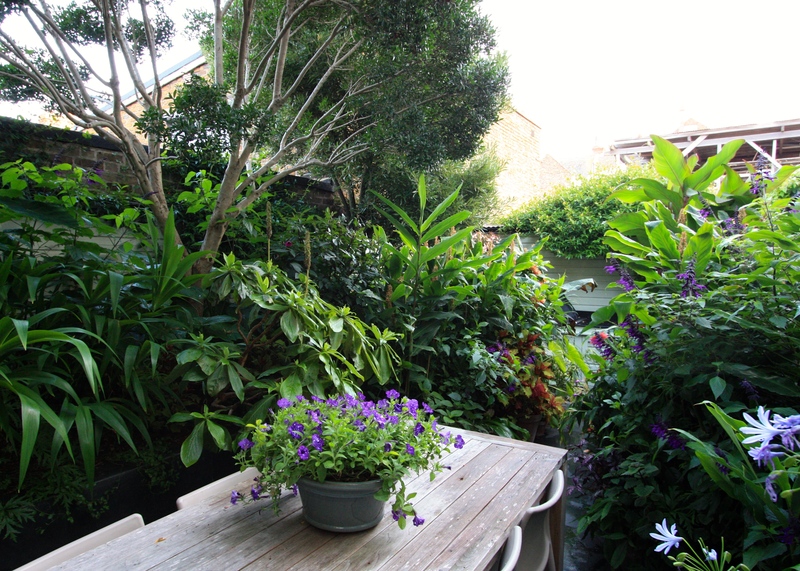 Your garden just keeps getting better, as ever looking fantastic. Whatever 2019 brings one thing is guaranteed, The Watch House will be as jaw droppingly lovely as it always is when you open the gate for the National Garden Scheme. Well done Dan, and £1,400.00 for the National Garden Scheme charities too, just brilliant. 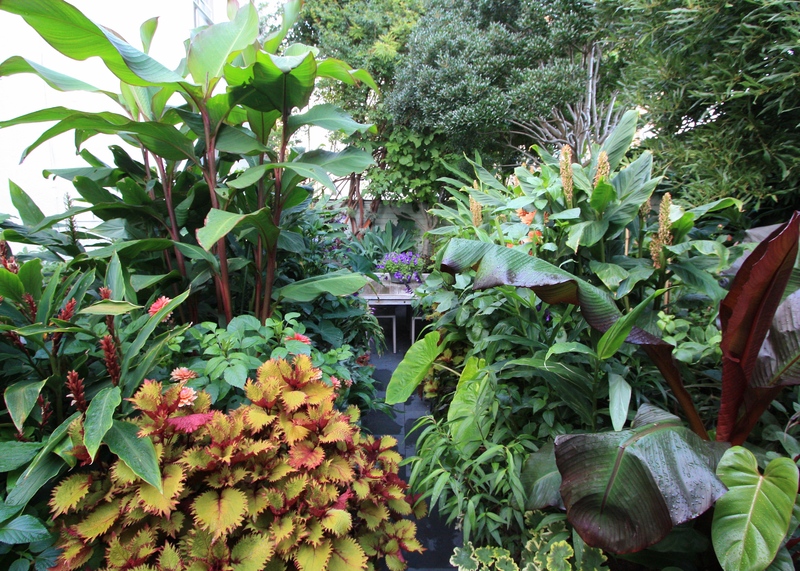 It is even nicer seeing pics of your garden having seen it in the flesh. I have loved the weeks and weeks of hot weather. I fear we’ve been spoilt now and will expect it next year. Hope your punctures have been repaired! Well I am so happy it’s autumn now and cooler. I dealt with the heatwave by hearing everything herbaceous back to the ground around mid July so the new growth at least looked green and fresh. I watered my pots (Harriet would have killed me if I hadn’t) but not the borders. The garden is 99 per cent green as I don’t do summer bedding or dahlias or any of the daisy family because slugs would eat them overnight. So all in all I’m looking out on fresh green foliage and lushness and strangely I too haven’t ordered my tulips yet. Every year up to now I’ve ordered them in May. I wonder if other people have delayed too. I really hope to visit your garden one day. It looks marvellous. There is so much there that I do not recognize. I see the Mussa, but what is that big perennial that looks like a Mussa to the left in the first picture? 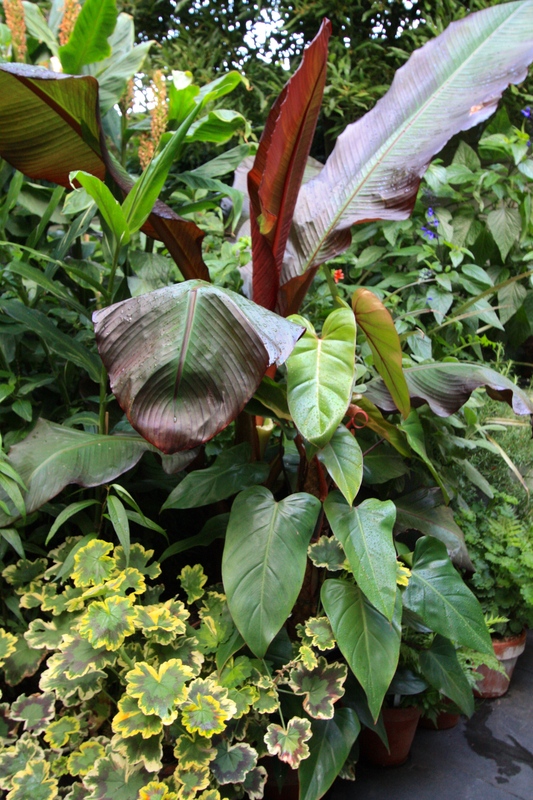 It looks like Mussa but it also looks like a bit Canna. Survival of the fittest? Perhaps that would describe my mid-July to late August with triple-digit heat and heavy smoke haze from British Columbia in the north and California in the south. Because of daily asthma flare-ups, I was forced to hibernate inside while my husband did all the watering. He refilled bird baths and feeders, but no birds arrived. Birches and dogwoods became sunburned. Geraniums gave up in the first onslaught but the roses carried on. Herbs had a jolly good time overgrowing themselves. And the past week begun ushering in September on soft, smoke-free breeze. I’m not fit but I did survive! The long cold Spring and then baking heatwave certainly gave rise to some strange happenings here in South Devon. The zinnias which I bought from a roadside honesty box as bedding plants are currently taller than me (I’m 5ft 6in) whilst the sweet peas and runner beans, both chosen for their unusual violet flowers, have hated the heat and have hardly flowered at all. And woe betide the hapless vegetable gardener – only our Mediterranean herbs have been good, lovely dill flowers waving about above our heads whilst peas and now sweetcorn beg for water despite constant constant attention! Our water is metered so we really can’t use a hosepipe and we are now spending half the morning ferrying cans of bath water down the stairs and out into the garden. As you say Dan, it will be very interesting to see what happens next year! And I’m wondering too if there’s more extreme weather to come this year? Greetings from East Kent! They say it will be warm right through to the end of November Julie. I will believe it when it happens!! I am sorry for your sweet peas, runner beans, sweet corn and peas, but your zinnias sound magnificent. They must be in heaven. My cosmos were dismal so I must have done something wrong there. They’re the wrong plants for my garden entirely, but I like them. Jungly it is! And my eyes have never spotted a stake in your beautiful pictures. Dan again I’m thirsting for details….about the watering process, how do you do it?? Do you have a nice shower or mist nozzle on the end of a hose, do you use a can (I can’t imagine a can with the quantity you must care for)? How do you get to the pots near the back of the layered scheme? How do you know you are soaking them well to the bottom of the pots, you must have dozens? hundreds? to check…. Like others, some plants thrived , others succumbed. I lost a few then started watering those I did want to keep going through the drought which we had even down here after one of the wettest winters and spring. The gales provoked a bit of a mess which I am trying to rectify before a VIP comes to stay with us later in the month! He he! Please don’t go to any trouble on my account. I know better than anyone that compulsion to have everything looking immaculate for visitors. I understand West Country weather pretty well too. I am certain your garden will look lovely regardless of what the elements throw at it. Your garden is just gorgeous! Hands-down the best thing about gardeners is that they will work like lunatics for something they can’t yet see – it’s a rare condition of faithfulness, or devotion – a strange fidelity. And when it looks like this – like a paradise that seems impossible to design – then it all makes perfect sense! Thank you so much! The garden was indeed a labour of love this year. I can’t quite imagine doing it all again next year, but of course I will! I was only thinking earlier today that I would struggle to ‘design’ a garden in the conventional way. So much of what I do is based on trial and error, intuition, impulse and responding to the prevailing conditions. Ho, to say this season has left me a tad ‘forked off’ is a massive understatement.- a total shock in droughty east anglia has led to a complete re-evaluation of my garden (ahem) style…going full-on xeric with large seed orders of dianthus flax, penstemons. verbascums, knapweeds and sedtm. I also have a titchy-tiny courtyard which is not looking brilliant. A summer of continual watering, in what is essentially a pot garden, has left me with compacted, depleted soil…but still alive. Unlike the allotment where I couldn’t compete with potato growers, who jealously hoarding time on the single water outlet – even the baptisias croaked. Sigh. I KNOW how hard you must have worked to keep yours so green and lush – well done, you. Sorry to have taken so long to reply! I read this when your email first went out but I have been in a work black hole since then. I can imagine how long you’ve worked on your garden this year. It’s been one of the toughest years I’ve experienced in the garden and my plants certainly don’t look as good as yours do this year – so can only imagine how much time you’ve spent on it. Your hard work paid off though, the garden was wonderful on your open day and all very much appreciated by us visitors. But hopefully you can take a break and have a rest too! How perfectly beautiful! 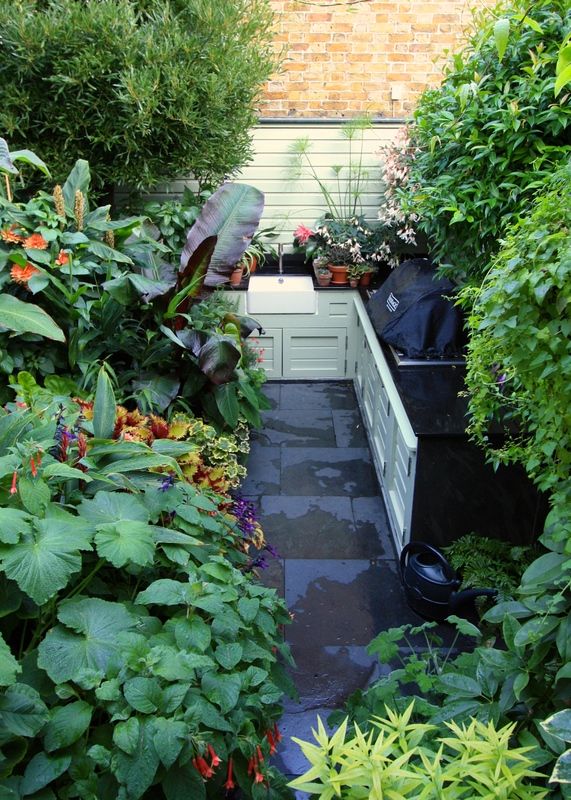 Your garden is a testament to your skill and creativity, especially since it is mostly achieved in containers. I have only about 30 containers and they seem to require much more attention than my border plants. What a year for gardeners everywhere. In central British Columbia we have had the summer that never came. The worst fire season on record, 130,000 sq km burned, meant heavy smoke all summer. On many days our air quality was rated the worst in the world. Skies were as dark as night at mid day. We were advised to stay indoors as much as possible. I ventured out to water and to wash ash off plants and decks and to commiserate with my poor garden. Heavy frost is expected tonight with possible snow. Today I will be bringing in my tender container plants and saying goodbye for the winter to my perennial borders. Winter lasts at least six months with heavy snowfall and temperatures of – 30 and lower. Gardeners are a stubborn lot. Wherever we are, whatever the conditions, we obey the compulsion to grow things. So, during the long winter I will be dreaming of next summer, making plans and reading gardening books…and your wonderful blog.